Mix the sauce ingredients together in a bowl then pour ¾ of sauce into a large freezer bag, reserving the rest to serve with the cooked meat. Put the chicken or pork into the bag and seal. Place the bag in the fridge and allow to marinate for at least 15 minutes or longer, if you’re preparing ahead. If using chicken, remove from the bag, place on a roasting tray and cook in the oven following pack instructions. 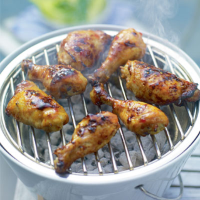 Once cooked (the juices will run clear when tested with a skewer), remove from the oven and immediately place on the barbecue for a few minutes to brown, absorb the barbecue flavours and give a flame-grilled effect. For the pork, barbecue until cooked all the way through, brushing with the marinade left in the freezer bag every. Serve the meat with the reserved sauce. A good choice of wine is Zalze Bush Vine Chenin Blanc 2010 Coastal Region, South Africa – its ripe zesty and tropical characters balance the complexities of this marinade. For beer, try Bitburger Pilsner.